“Birdman or (The Unexpected Virtue of Ignorance)” (2014). Cast: Michael Keaton, Edward Norton, Emma Stone, Naomi Watts, Andrea Riseborough, Zach Galifinakis, Amy Ryan, Lindsay Duncan, Jeremy Shamos. Director: Alejandro González Iñárritu. Screenplay: Alejandro González Iñárritu, Nicolás Giacabone, Alexander Dinelaris and Armando Bo. Web site. Trailer. 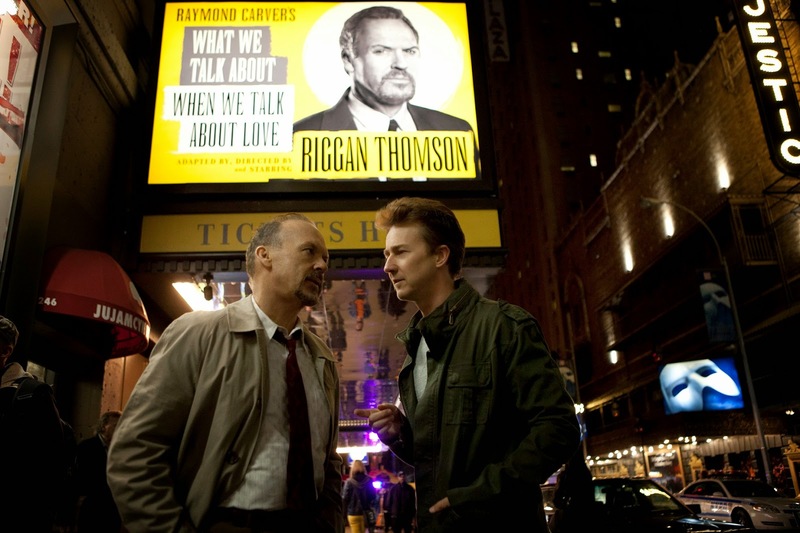 Riggan Thomson (Michael Keaton) is trying to figure out his life. The late middle-aged actor, who made a name for himself 20 years earlier portraying a big screen action hero named Birdman, seeks to redeem his sagging career by directing and starring in a new Broadway production. The play in question, What We Talk About When We Talk About Love, is based on a Raymond Carver short story that Riggan has adapted for the stage. This piece represents a radical departure from Riggan’s typical fare, but it’s an attempt to return to the early days of his acting career, when he was performing more serious material, a time when he earned the praise of Carver himself. But, as earnest as Riggan is about staging this new play, the production is fraught with problems. For example, one of his principal actors, Ralph (Jeremy Shamos), is severely injured during rehearsal right before previews are set to begin. While Riggan is not entirely upset with needing to find a replacement (Ralph’s acting is terrible), he’s still saddled with the challenge of having to do so at the eleventh hour. Thankfully, another of his performers, Lesley (Naomi Watts), recommends a stand-in, Mike Shiner (Edward Norton), her romantic partner – and one of the hottest names on Broadway. 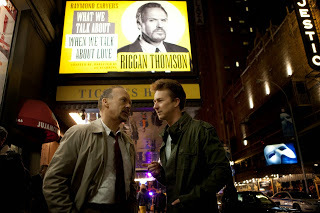 When faced with needing to make a last-minute replacement for one of his performers for his new play, writer-director-actor Riggan Thomson (Michael Keaton, left) taps the services of Mike Shiner (Edward Norton, right), one of the hottest names on Broadway, in director Alejandro González Iñárritu’s latest offering, “Birdman or (The Unexpected Virtue of Ignorance).” Photo courtesy of Fox Searchlight Pictures. Still, even though Riggan is able to find a replacement, his challenges continue: Mike proves to be a capable but highly unpredictable substitute; some elements of the play work, while others don’t, causing Riggan to frequently second-guess the viability of his project; money issues threaten to undermine the production’s future, especially with an impending lawsuit from an injured actor looming; and scathing, prejudicial, unjustified attacks from a powerful, self-important critic (Lindsay Duncan) endanger the play’s run before it even starts. 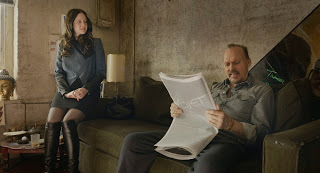 Patching up a troubled parental relationship is a goal for aspiring Broadway actor Riggan Thomson (Michael Keaton, left) and his daughter, Sam (Emma Stone, right), in director Alejandro González Iñárritu’s “Birdman or (The Unexpected Virtue of Ignorance).” Photo courtesy of Fox Searchlight Pictures. If all that weren’t bad enough, Riggan has his share of issues to contend with offstage as well. For starters, there’s his troubled relationship with his daughter, Sam (Emma Stone), a production assistant on the play who recently emerged from drug rehab. Then there’s Riggan’s on-again/off-again relationship with one of his co-stars, Laura (Andrea Riseborough), a promising and potentially healthy romance that, unfortunately, he often takes for granted because of his many other preoccupations. But, perhaps most importantly, there’s the recurring voice in his head, that of an alter-ego of sorts – the character he portrayed on the screen so many years ago – who alternates between deriding Riggan and counseling him on how to reclaim his personal power. The on-again/off-again romance between actor Riggan Thomson (Michael Keaton, right) and his co-star, Laura (Andrea Riseborough, left), is one of many troubled relationships associated with a new Broadway production in “Birdman or (The Unexpected Virtue of Ignorance).” Photo courtesy of Fox Searchlight Pictures. Riggan’s challenges obviously give him a full plate to manage. Thankfully, he’s not without support, such as the aid provided by his producer, attorney and best friend, Jake (Zach Galifinakis), and the loving compassion of his ex-wife, Sylvia (Amy Ryan), both of whom always manage to show up and offer assistance just when it’s needed most. And, then, there’s the aforementioned advice served up by Birdman, who seems to have Riggan’s best interests at heart, even if his recommendations don’t always involve suggestions that our hero wants to hear. When trouble strikes the life of an aspiring Broadway actor, he fortunately has the support of his best friend, Jake (Zach Galifinakis, right), and his ex-wife, Sylvia (Amy Ryan, left), to come to his rescue in the unconventional new dark comedy, “Birdman or (The Unexpected Virtue of Ignorance).” Photo courtesy of Fox Searchlight Pictures. So how will everything shake out for Riggan? It all comes down to what he’s willing to believe, particularly about himself and the reality he creates. Of course, that requires him to sort out what he believes in the first place, a feat easier said than done. To his credit, he’s willing to pursue practices like meditation to help him get a handle on matters, but, if any of his issues are to be successfully resolved, he must commit to doing the work needed to realize that goal – and that’s what his story (and this film) are ultimately all about. To get where we want to be in life, it’s imperative that we take charge over our personal power. To do that, though, we must first believe we can and then know what we want to do with it. For his part, Riggan struggles on both fronts. This is where the significance of the conscious creation process comes into play, for it impels us to get a clear handle on what we believe and, consequently, how we employ it. And that’s crucial, because what we materialize in life is a direct result – and reflection – of our beliefs, especially those that characterize the core of our being. In Riggan’s case, the primary core belief issue he struggles with is the ability to distinguish between matters of love and admiration. He has always confused the two, often believing that admiration equates to love, and such thinking has been faithfully reflected back to him in his professional accomplishments and personal life. But does the admiration he receives fulfill him in the same way that love does? And, if not, what does it take to get the love he hopes for? That’s what Riggan’s current experiences are all about – to illustrate why he’s getting the results he does and to show him the way toward what he truly wants to achieve. Such is the power that comes from our judicious application of discernment. Lesley (Naomi Watts), one of the stars in a new Broadway production, realizes her dream of finally making it to the Great White Way in Alejandro González Iñárritu’s “Birdman or (The Unexpected Virtue of Ignorance).” Photo courtesy of Fox Searchlight Pictures. This theme plays out in many ways in the film. Consider, for instance, the play Riggan is staging. Look at its subject matter, and compare that to the quandary he’s seeking to reconcile. The parallels are more than a little coincidental. But is Riggan’s rationale behind this production based on the admiration he’ll get back from audiences and critics or from some hoped-for outpouring of love that will come flooding his way? This conundrum is also mirrored back to Riggan through the lives and creations of those around him. In their own ways, they, too, wrestle with issues of reconciling love and admiration (particularly in terms of what they get from Riggan in these regards). For instance, Riggan clearly admires Laura for her acting talent and her personal qualities, but, considering the emotional distance he often places between them, does such admiration really equate to heartfelt love? In many ways, it would seem not. And, for her part, Laura recognizes this deficiency in their relationship, realizing that, if she ever hopes to be happy, she must change her beliefs to change her circumstances to attract what she wants in life – those manifestations that are genuinely in line with her core convictions. Riggan’s awareness of this core distinction is obviously not as clearly defined as it is in the minds of others, so his challenges regarding it permeate more aspects of his life than it does in the lives of those around him. And, in an attempt to make sense of it all, he often looks outside of himself for answers. However, as seasoned conscious creators know, the real answers lie elsewhere – inside, in the realm of our beliefs – which is where Riggan needs to look, too. If Riggan believes he readily receives admiration but not love, then he must ask himself why. From a conscious creation perspective, that shortcoming almost certainly has nothing to do with what he gets from others but, rather, what he gives to himself. Indeed, if he believes he’s incapable of genuinely loving himself, is it realistic to expect that he’ll receive love from others? If he ever hopes to rectify circumstances in his outer world, he must first do so in his inner world. But, once he does, that change of heart is sure to be reflected back to him in the reality he experiences. To a great degree, this is where Riggan’s alter-ego comes into play. Birdman pushes his real-world counterpart to take a hard look at himself and his beliefs, to encourage him to see where he truly excels, and to see why people either love or admire him. In his own unconventional way, Birdman realizes that the insights Riggan gleans from these musings will help him understand himself and his beliefs better, which, in turn, will fuel his sense of personal empowerment. And with his empowerment energized, Riggan can more effectively create an existence that brings him what he wants – no matter how unusual that may be. 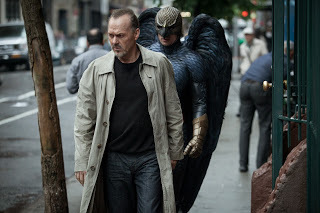 Riggan Thomson (Michael Keaton), a former big screen action hero, is haunted by his past as he struggles to make a career transition to a Broadway actor in the audacious, unconventional dark comedy, “Birdman or (The Unexpected Virtue of Ignorance).” Photo courtesy of Fox Searchlight Pictures. Without such clarity of thought and personal empowerment, however, Riggan (or any of us, for that matter) won’t be able to manifest what we seek. When fear, doubt or an internal sense of contradiction is allowed to hold sway (all of which Riggan wrestles with to one degree or another), sought-after results simply won’t materialize. To be sure, if our hero aspires to the heroic attainment of fulfilling his innermost destiny, these are the steps he must take. And, if he does, he just might soar. “Birdman” is definitely not for everyone, but those who appreciate the thoughtfully offbeat will certainly enjoy this quirky offering. It’s an audacious black comedy that makes us think as much as it does laugh. Its metaphysical insights are spot-on, as are its incisive observations of what we believe constitute love and admiration in today’s culture (such as unapologetically posing questions like, “Is a massive Twitter following really a valid measure of love for someone?”). Admittedly, there are some lapses in writing and pacing at times, but they’re more than compensated for by its many other attributes, such as its distinctive soundtrack and inventive visual effects. The picture’s greatest strength, though, is its superb ensemble. Keaton shows a range in this role unlike any other part he’s ever played, and he’s a deservedly strong contender for awards season consideration. The supporting cast is excellent as well, with Norton and Stone turning in some of the best work they’ve ever done. Even those players with small roles, like Duncan, shine in their performances. This truly is an actors’ film, and viewers who value the art will certainly relish the stellar portrayals on display here. Realizing the life we desire is a truly admirable goal, but we had better be prepared to do the work necessary to achieve it. That means getting our belief houses in order through the virtues of discernment, clarity of thought and personal empowerment. At the same time, we must also avoid the pitfall of overthinking our circumstances, for that practice has the potential to keep us from making effective use of those conscious creation powers that are integral to our accomplishments. If we triumph on those fronts, we just might find ourselves taking flight, successfully bringing our high-flying aspirations into being, no matter what they may be.